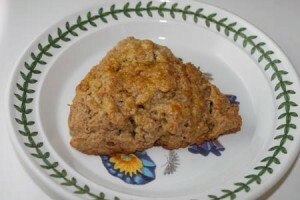 Cinnamon Raisin Scones recipe by Marium Hamid at DesiRecipes.com. In a medium sized mixing bowl, measure 1 3/4 cup flour, 3 tablespoons sugar, baking powder, cinnamon and salt . Melt butter and place in a medium bowl with the applesauce. Add milk, egg and raisins . Stir until ingredients are blended. Stir until dough forms into a ball. Sprinkle the 3 tablespoons flour on a flour surface. Flour your hands well and move dough from bowl to surface. Knead the dough by using the heel of your hand to push the dough away from you. Then with your hands, pull the dough back toward you, folding over as you pull it. Repeat this for about 1 minute. Place the kneaded dough on an ungreased cookie sheet or pizza pan. Pat the dough into an 8" circle. With a knife or pizza cutter, cut the dough into 8 wedges. Place baking sheet in a preheated 425 oven and bake for 15-20 minutes or until golden brown. Instead of raisins , try other dried, chopped fruit such as apples, apricot, mango , papaya, etc.